Enter your dates with a minimum of 180 Nights (6 Months) to 365 Nights (12 Months) and select property rentals, from the "categories" drop down menu, to find long term rentals. Prepare to move to Puerto Vallarta and choose a neighborhood to live in. We offer the largest inventory of condos, apartments, house and studios available as long term rentals. Areas like Marina are expensive because they are surrounded by a golf course and yacht slips, fine restaurants and art galleries. The hotel zone is a strip of resorts and modern shopping centers. Downtown Puerto Vallarta is where the famous malecon is located- loud, popular with tourists, fast paced. Romantic Zone or Old Town Puerto Vallarta is more traditional with cobblestone streets, fine restaurants and coffee shops. Mismaloya is in the south shore where you can find lush tropical jungle lined with villas and luxury condominiums overlooking the bay of banderas. Do you dream of getting away from it all? Puerto Vallarta is your perfect destination for taking an extended holiday in a tropical paradise with swaying palm trees, sun soaked beaches, and a laid-back lifestyle! For over 60 years, travelers have fallen in love with this oasis nestled along the beautiful waters of Banderas Bay. 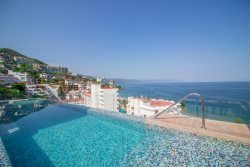 With traditional Mexican hospitality, warm weather, a huge variety of restaurants and bars, state-of-the-art medical facilities, shopping, arts and entertainment, and an endless array of outdoors activities, Puerto Vallarta has become a top destination for expats in search of new adventures. Do you have plans of living in Puerto Vallarta full time?